The historical background to the dance is the story of the defeat and conversion of the K’iche’ nation by Spanish conquistadores, led by Pedro de Alvarado ,and with an army largely consisting of Nahuatl-speaking Indigenous Mexicans. The result of this clash, and thus the motivation for the play, is that it represents the foundation of subsequent Guatemalan Maya society as stemming from the submission of the K’iche’ to non-Indigenous authority and their conversion to Catholicism. However, the Dance of the Conquest does not follow the historical events accurately, but alters them both for theatrical impact, and for religious reasons, to celebrate the syncretic Maya-Catholic religion often called Costumbre. Some of these alterations, such as the duel between Tekum and Pedro de Alvarado, were derived from 16th century títulos, the documents written to demonstrate the rights to lands and privileges claimed by Maya nobles, then called caciques. The historical events, insofar as they are known, may be summarized briefly. The most important sources for this narrative are a letter of Pedro de Alvarado to Hernán Cortés from 11 April of 1524, two months after the events it describes, and Ruud van Akkeren’s, La Vision Indígena de la Conquista of 2007. In December of 1523, Pedro Alvarado left Mexico with his force of Spaniards and Tlaxcalans under orders of Hernán Cortés. Cortés’ plan was for Cristobal de Olid to take a northern route by sea to Honduras, and for Alvarado to take a southern route by land to meet Olid. By February 1524, Alvarado’s army had entered what is now Guatemala, first marching along the coast from Soconusco, and then turning inland. Their first major battle was the resistance of the population of Xetulul, now known as Zapotitlan, then under K’iche’ control. As part of the K’iche’ nation, Xetulul’s army was increased with soldiers from farther north. Alvarado managed to take Xetulul, defeating its army and capturing some of its leaders, who he took with him as he traveled upward to the north, torturing them for information on availability of gold. The defeat of the K’iche’ at Xetulul and in later battles is partly due to the weapons technology, of which the most devastating was the mounted cavalry. (For this reason, the K'iche' quickly learned that they must attack the horses first). It was also due to the prior loss of about half the Indigenous population due to Spanish-introduced diseases (measles and small pox) that travelled faster than the army. 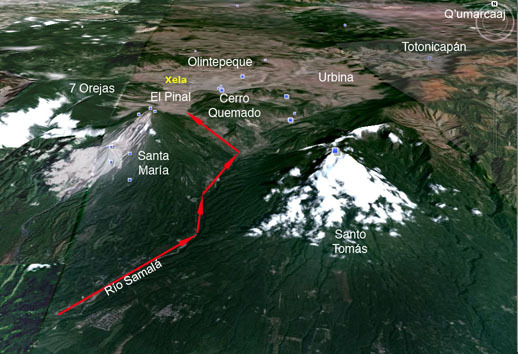 Some of those who escaped from Xetulul carried the message of the Spanish advance north to Xelajuj and northeast to the K’iche’ capital Q’umarcaaj or Utatlan. The primary K’iche’ ruler or Ajpop, K’iq’ab’ 3 Deer, recalled his heir and military captain, Tekum, from the secondary capital at Xelajuj Noj (which at this time may have been located near present-day Salcajá, rather than the current location of Xela or Quetzaltenango). After arriving at Q’umarcaaj, Tekum, whose calendric name is not known, gathered his army and marched down the main highway through Chwi Mek’ina/ Totonicapan and into the valley to Xelajuj Noj, which at that time may have been situated where Salcajá is now. Tekum ordered defenses to be built, including walls at entrances to the valley. From Xetulul, Alvarado led his forces upland along the narrow canyon of the Río Samalá. After two days marching Alvarado’s army turned away from the Samalá river and into a route that leads to the Cuesta de Santa María. At the end of this passage, where it enters the valley lands of Palajujnoj (now Palajunoj) the invadors encountered the defensive wall and a fierce resistance of K’iche’ forces. Despite being at a disadvantage on broken ground difficult for cavalry maneuvers, they managed to succeed and break through, entering into the more advantageous flatlands of the valley. . On the other side of Palajujnoj they reached the flat lands called the Llanos of El Pinal (Pine Flats) or Pachaj where they were beset by a larger K’iche’ defense force, led by Tekum. Again the invading force skillfully used the cavalry to break through the K’iche’ lines and surround the defenders, winning this battle as well, at which the K’iche’ retreated. 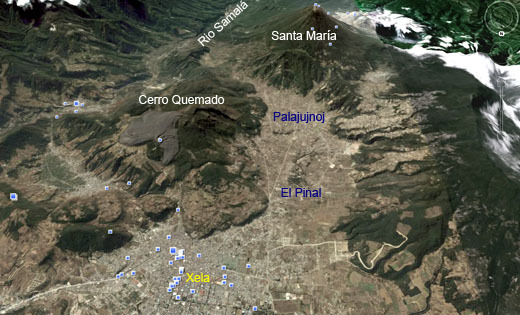 The invading army then descended into the main part of the valley (now the outskirts of Xela) where they found springs. While they were drinking, the K’iche’ attacked again. In this third battle, the cavalry chased the K’iche’ into the hills, probably at Olintepeque. As the hilly area is disadvantageous for the cavalry, the Spaniards pretended to retreat, drawing the K’iche’ back down into the open flat area adjoining the river, then charging the K’iche’ and slaughtering them. This is the river Xequikel, meaning “Under Blood”, though it may have had this name before the massacre, due to the reddish colour of the mountains above. It is not known whether the captain-general Tekum died in the second battle, at El Pinar, or the third battle on the same day, at Xequikel. Alvarado simply reported that on that day “one of the four chiefs of the city of Uilatan [Utatlan/Q’umarcaaj], who came as the captain general of the whole country, was killed.” In Maya sources also, the three battles of this day are often referred to collectively as the Battle of El Pinar. After the slaughter at Xequikel, the K’iche’ forces vanished from the field, and after camping for a night the Spaniards moved in to occupy the city of Xelajuj. But after three days they saw that the K’iche’ army had regrouped and was advancing toward them. Alvarado quickly ordered his troops out of the city to the flat lands that were advantageous to his cavalry. The invading force met the K’iche’ defenders and drove them to the plains of Urbina, where an even greater slaughter was carried out than in the battle at Xequikel. After this second massacre, the K’iche’ could no longer mount an effective open resistance, so several of the K’iche’ leaders, thereafter referred to as caciques, came to Alvarado in Xelajuj and offered their submission. They may or may not have been baptized Christians at this time. While they were aiding Alvarado’s troops in quelling any dissent in the region, messengers arrived from the Ajpop in Q’umarcaaj, also offering submission and inviting Alvarado and his army to the capital. The army marched the next day and were well-received by the two K’iche’ rulers, the Ajpop 3 Deer and Ajpop K’amja 9 Dog. Alvarado did not keep his army within the city, considering it disadvantageous should their be resistance. He moved it to a flat area outside, and at the same time captured the two rulers and tortured them to extract gold. When insufficient amounts were turned in by other nobles, though actually due to a general lack in the region, Alvarado became convinced that the K’iche’ were holding out on him and as punishment he burned the two elderly K’iche’ kings to death and burned the city of Q’umarcaaj. To defend his actions, he later wrote that the K’iche’ rulers had actually planned to burn him and his army, a ruse which he had used before in Oaxaca and which, shortly later, Bartolomé de las Casas recognized as false. Alvarado next sent word to the Kaqchikel leader, the Ajpop Tzotzil, Sinacam Kahi Imox, for reinforcements designed to test the latter’s loyalty as well as help clear pockets of K’iche’ resistance. 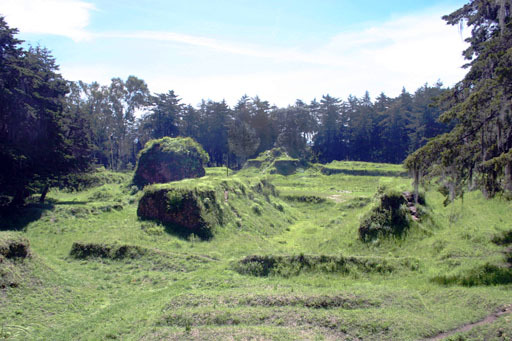 After the birth of his daughter, Leonor, by the Tlaxcalan princess Luisa Xicotencatl, Alvarado moved his army to the Kaqchikel capital Patinamit, now known as Iximche. From there his armies set out on a journey of conquest that included the Tzutujil of Lake Atitlán and extended to Cuzcatlán, now San Salvador.